By-the-minute news on the races important to you. Beginning 8 a.m. Tuesday, we'll have updates from the campaign trail and Lincoln-area polling places. Stay with us into the evening for breaking news and results. "We are an American family and we rise and fall as one nation," President Obama says in victory speech. "We have fought our way back ... For the United States of America, the best is yet to come." Thanks for visiting our live update blog tonight. Please visit JournalStar.com for analysis of the results and where things go from here. For those of you who are wondering, this is how your comments will appear. Need a lift to the polls? The Lancaster County Democratic and Republican parties are offering free rides to the polls on Tuesday. Voters in need of a ride can call the Democrats at 402-476-2268 or email coordinator@lancastercountydemocrats.org. Or call the Republicans at 402-475-2122 or email andrew@negop.org. Anyone interested in providing rides is welcome to help the Democrats by meeting at the party's office, 2215 C St.
Bennet resident Barbara Mullenax and her 7-year-old granddaughter, Morgan, walked together to the Bennet Community Hall Legion Post 280 on Tuesday. "I brought her so she'll understand how it's important to vote," Barbara Mullenax said. Morgan said she may have accompanied her grandmother one other time to vote. Morgan agreed that it is indeed important to vote in this election. Why? "So the people know who they want -- Mitt Romney or Barack Obama." "Big surge" when polls opened this morning, said election inspector Diana Yearsley at Christ United Methodist Church. A line had already formed outside the door by the time the church at 45th & A opened up to voters at 8 a.m.
"It wasn't eight hours long like Florida or anything like that," Yearsley said. "Maybe six people, but typical of a presidential election." The election inspector says voters can expect to cast ballots in about five minutes this morning. Forty-one ballots were logged by 8:45 a.m. Yearsley said highest turnouts are expected between 4 p.m. and early evening, but -- at least in her location, typically a higher-volume one -- wait times should't be an issue for voters. "Just get out and vote." Sharing this from our Twitter feed -- from Kristen ‏@K_needs_help -- @JournalStarNews For the first time, there was a line to vote at my polling place. Wonderful to see! Want to tweet into this chat? Just use the keyword tag #LNKelections, or sign into the chat box above using your Twitter account. UPDATE: Twitter follower @AlisonKnudsen sent us this additional Election Day deal -- 10% off with voting sticker at One More Time, 17th and Van Dorn. Younkers has a coupon for $20 off a $50 purchase, which works out to a 40 percent discount. You can also show them your “I voted” sticker in lieu of the coupon. Toppers Pizza is offering $5 large pizzas and $5 Topperstix all day today. The company said that when it offered the same deal during the 2008 presidential elections, its website traffic increased 7.4 percent, and some locations in Wisconsin had to shut down because they couldn’t keep up with demand. One of the more interesting election day offers is JetBlue’s offer to allow people to fly out of the country if their presidential candidate loses. The airline is offering 1,006 free round-trip tickets, which adds up to 2,012 seats, to people who picked the losing candidate in an online poll. Unfortunately, voting is closed, so you can’t still get in on the deal. Destinations include, Mexico, several Caribbean islands and a couple of countries in South America. It may be a pretty windy day for golf, but a couple of dozen cars still are in the Highlands Golf Course lot. 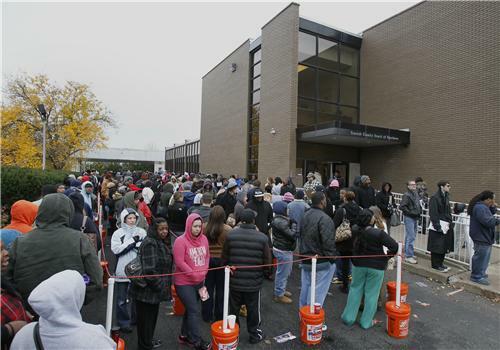 The polling site was up to 155 voters by noon, with a steady trickle coming and going. I made #156. 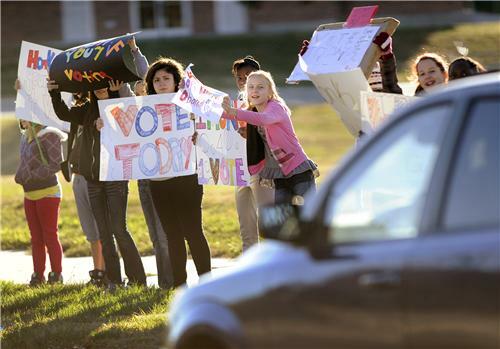 Eagle Elementary School students got a lesson in voting today. Precinct Inspector Kelly Gillaspie reported steady traffic in the lunchroom, where there were 241 ballots cast by noon and 6 provisional ballots. Right up to the time when Congress went home for the election, farm groups regularly aligned with either the Republicans or the Democrats were calling for passage of a farm bill. The job is still undone, but the inattention of Congress on legislation is nothing compared to the inattention of President Obama and challenger Mitt Romney to agricultural issues in the 2012 campaign. John Hansen, president of the Nebraska Farmers Union, and Steve Nelson, his counterpart with the Nebraska Farm Bureau Federation, are among those shaking their heads in a major farm state. Hansen said the president could have claimed some credit for the bustling agricultural economy. “In farm country, we never made as much money in the last 60 years as we made in the last four,” he said. But no matter how much agriculture matters in Nebraska, Nelson said, the number of voters on the front lines of crop and livestock production matters more to a presidential campaign. The combative tone of the Senate race between Deb Fischer and Bob Kerrey didn’t leave a lot of room for promoting contrasting farm policies, Hansen said. Vince Powers, chairman-elect of the Nebraska Democratic Party, has been engaging in spirited and sometimes rancorous political debates on Facebook with Republicans – including GOP state chairman Mark Fahleson – in the weeks leading up to the election. Today, however, Powers posted a quote from Thomas Jefferson: "I never consider a difference of opinion in politics, in religion, in philosophy, as cause for withdrawing from a friend." Recent polls showed Democrat Bob Kerrey closing the gap in his race with Republican Deb Fischer for Ben Nelson’s U.S. Senate seat. Whether Kerrey pulls it off remains to be seen. But if he does not, it won’t be for lack of effort. I got two calls on the cell phone today from the Kerrey campaign -- asking me, a registered independent – for my vote. In my precinct at about 54th and South Streets, there’s never a line. And there wasn’t today at noon when I voted, as No. 91. But there was a fairly steady stream of voters -- unusual but encouraging. I went back at 4 p.m. to see how things were going, and still no line, but busy. The precinct workers said the turnout so far was “very good” for the area. The 187th voter was signing in. More than 100 were listed as voting absentee. With 573 registered voters, that’s about a 50 percent turnout, with four hours left. Voter No. 188 was a young woman who is quadriplegic who chose to vote on the electronic voting machine required at each precinct since the Help America Vote Act of 2002. It was good to see the machine being put to good use. The New York Times is calling the first states in the Presidential race. Vermont goes to Obama. Romney takes Kentucky. CNN calls Georgia for Romney. No surprises yet. Independent Angus King wins in the Maine Senate race, which hurts Republicans' chances of taking control of the Senate. Latest presidential projection via CNN: Romney wins Alabama, Obama wins Massachusetts. Electoral count 82 Romney, 64 Obama. Obama is leading in Ohio 58 percent-41 percent, with 21 percent of votes counted. Fox, CBS and NBC all are calling Pennsylvania for Obama. As preliminary results rolled out in a hotly contested U.S. Senate race, a confident Bob Kerrey took the stage at The Single Barrel in Lincoln on Tuesday night, telling a crowd of more than 200 "the odds favor us being able to declare victory." Kerrey entered the restaurant and bar just before 8 p.m., just as his campaign's planned celebration at the Embassy Suites in La Vista began. Speaking over crowd applause, Kerrey yelled out "are we gonna win?" before taking the podium to thank and energize supporters. "We didn't think this was gonna be easy," Kerrey said, with a laugh. "And we have not been disappointed." 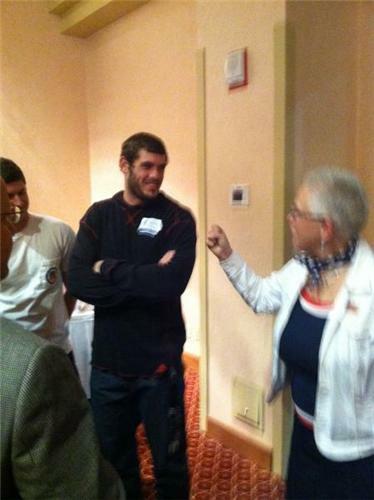 The former governor went on to explain that he was confident about his odds. "We will at some point be able to celebrate a great victory for the state of Nebraska this evening," he said, before the crowd broke into chants of "Kerrey, Kerrey!" Campaign volunteers dined and watched results roll out on projectors set up throughout the hall. Stephanie Pickerel, who handled social media outreach for the Kerrey campaign, said she felt good at the candidate's odds, noting that she saw widespread support for him on Facebook today. As to whether anticipation would build ahead of his event in La Vista, Kerrey laughed "what I'm gonna be thinking is, 'I've got one more speech then it's over.'" Two big Senate victories for Democrats: Elizabeth Warren projected winner of Massachusetts Senate race by CNN, with Joe Donnelly defeating Richard Mourdock in Indiana. Lavon Heidemann pulls ahead in regents race, 8,264 to 7,514 votes with about 10 percent of precincts counted. Missouri called for Romney by CNN, giving him 201 electoral votes. It appears President Obama has a big Electoral College win, but the popular vote is a different story. The latest numbers have both Obama and Mitt Romney with 49-million-plus votes, a near dead heat. 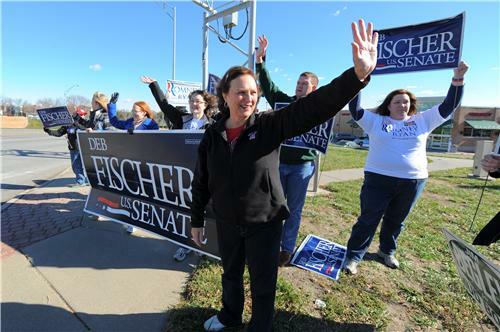 With 90 percent of precincts reporting statewide, Deb Fischer garnered 410,784 votes to Bob Kerrey's 291,191 votes. That's 58.5 percent to 41.5 percent. Obama projected to win Virginia, giving him 303 electoral votes to Romney's 203. Still awaiting word on Florida. Polls don't close in Alaska until midnight Central time but is seen as safe Romney territory.